What: How many times did you return from the market with a lot of fruits and thought to yourself: I need more fruit bowls? Well, let us tell you this: 1. you’re not alone and 2. you don’t really need a fruit bowl, as you need a fruit hanger. 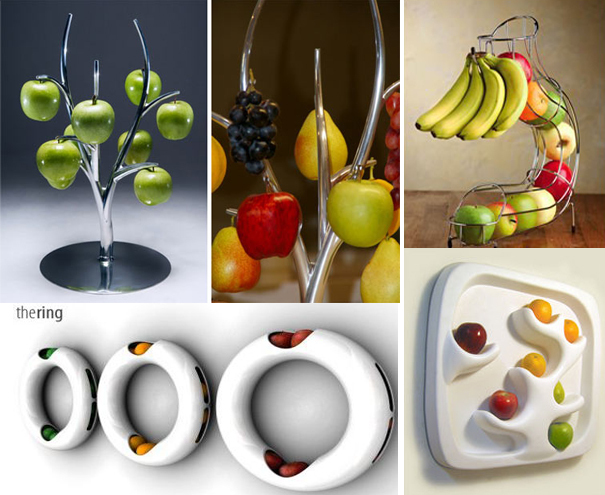 Simon Colabufalo presented at DesignEX 2012 in Sydney his innovative idea: a fruit hanger made in polished aluminum. The Eva fruit hanger is designed to actually bring the fruits back in the tree, thus being an innovative way of storing fruits. It’s an interesting concept and, if it ever goes into mass production, it will also be a great present for anyone. It’s a useful gift and also a functional one. The fruit is hanged by its stem, so you’ll have to be careful not to remove it. Being made in aluminum, the object is easy to clean. It goes well with a modern interior design and also in an office space. Where & How: For the moment, this is only a prototype. However, we provide you more ideas of fruit hanger.